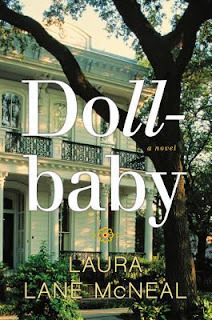 Dollbaby by Laura Lane McNeil is a 2014 Viking Adult publication. This highly praised novel has oft been compared to “The Help”, and to a lesser extent “The Secret Life of Bees”. However, I would advise you to avoid going into this book with that type of preconceived notion. This book is nothing at all like “The Help” with the exception of it being set in the south in the 1960's, and featuring strong black women, but the similarity ends there. When Liberty's ( Ibby) father dies suddenly, her mother abruptly drops her off at her paternal grandmothers' home without Ibby ever having met the woman, and with no indication when her mother might return for her. Fannie is nothing like Ibby thought she would be, and with Queenie and Dollbaby on hand, Ibby settles into a new life in New Orleans with these three special women who raise her into adulthood, while Ibby slowly unlocks the dark family secrets Fannie has hidden in the old house for all these years. uneasy backdrop to this engrossing coming of age story. Queenie and Dollbaby are the real caretakers of Ibby, although Fannie makes most of the big decisions about her granddaughter's future, such as attending a prestigious Catholic school, despite the fact they weren't Catholic, as an example. Queenie and Dollbaby know most of Fannie's secrets and moods, and slowly reveal them to Ibby until she finally has a clearer picture of who Fannie is and what is at the root of her instability. You will most likely begin to piece together the truth about Ibby's family as time passes on, but ultimately this is a story of friendship, love, and family. I had some mixed emotions about some parts of the story, but the south had its own way of handling things back in the day and Fannie and Queenie, especially Queenie, took an unorthodox approach in what was most certainly a no win situation. I still wondered at some of the ramifications of Fannie's story, but can't really dissect it in this review without giving too much away. I think the story is though provoking, atmospheric, sad, yet ultimately the truth, as harsh as may have been, really showed that love transcends all manner of obstacles, especially with family. Forgiveness, acceptance, and peace often come at a high price and all the women in the story made sacrifices in order to do what they felt was right or for the best. We may not agree with all their choices, but I did find them to be strong and inspirational, in the face of much tragedy and difficult times. Overall, I have some conflicted feelings about the novel, but any story that keeps me thinking about it long after I have turned the last page, means it left an impression, which is why i'm giving this one 4 stars.